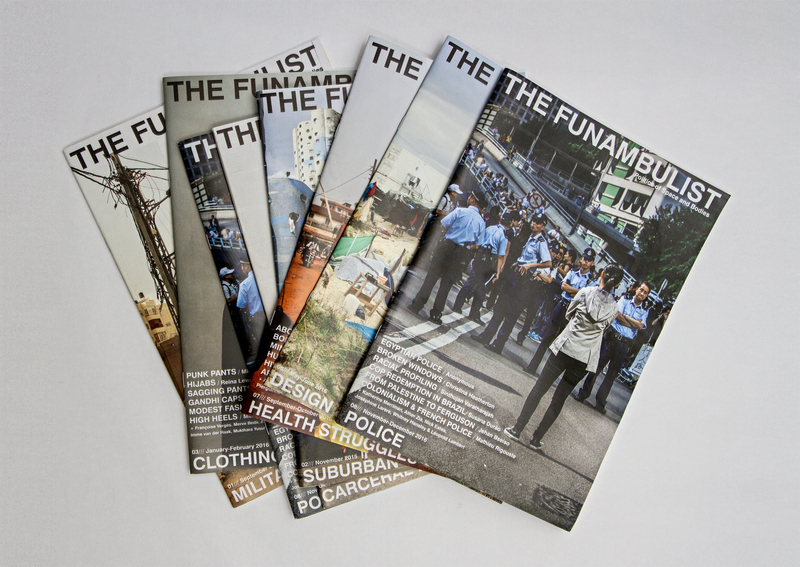 The Funambulist is a print and online magazine dedicated the politics of space and bodies initiated in 2015. 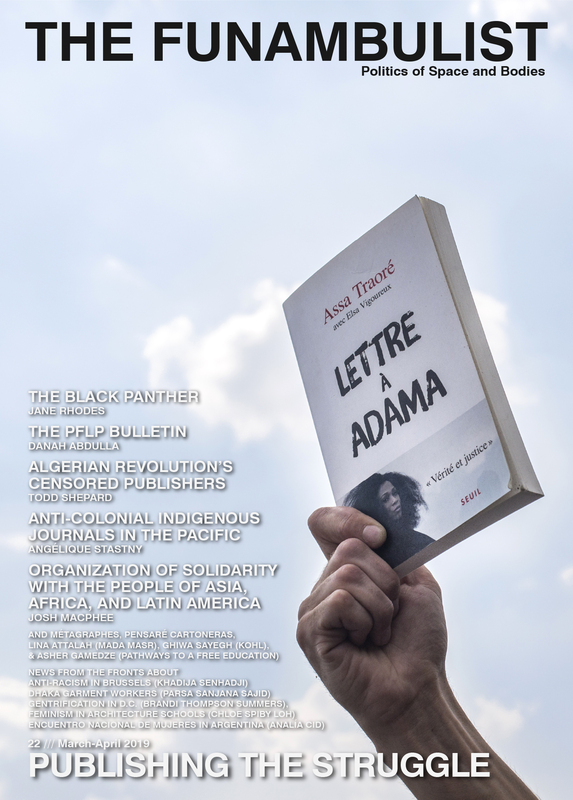 Every two months, it proposes to its readers spatial perspectives on political anticolonial, antiracist, queer, feminist and/or antiableist struggles in various scales and geographies of the world, written by our fantastic contributors. The magazine can be ordered on this website or through our partner bookstores and libraries. And if you enjoy reading it and want to support the project, you can subscribe to it on a monthly or yearly basis (we have student discounts!). On the open-access side, you can also listen to our podcast, read our blog or learn more about what we do here. Léopold Lambert is a trained architect, writer, and the founding editor of The Funambulist. He is the author of three books examining the politics of the built environment: Weaponized Architecture: The Impossibility of Innocence (dpr-barcelona 2012), Topie impitoyable: The Corporeal Politics of the Cloth, the Wall, and the Street (punctum books 2015) and La politique du bulldozer: La ruine palestinienne comme projet israélien (B2 2016). His next book is tentatively called États d’urgence : Une histoire spatiale du continuum colonial français (forthcoming 2019). Nadia El Hakim is an architect and exhibition designer based in Paris, France. 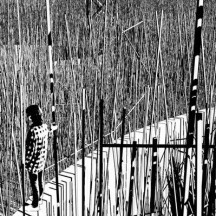 Graduated from the School of Versailles and TU Delft Faculty of Architecture, she is currently participating in projects of different scales along with a multidisciplinary team, at the edge of art, architecture and crafts. Her main research interests are situated in the mutations of the design process in the context of economic and political crisis, in Europe and the Middle-East. Margarida Waco is an Angolan-born business strategist, writer and emerging architect who continuously works in the intersection between spatial practices, strategic development and communications. She has a background in architecture from The Royal Danish Academy of Fine Arts (KADK) coupled with Journalism from Roskilde University and Sustainable Development from Sciences Po Paris. Alongside The Funambulist, she works as a research assistant focusing on urbanisation in Sub-Saharan African region. Carol Que is a writer, researcher, and educator living on unceded Wurundjeri land (Melbourne, Australia). Her PhD research revolves around visual cultures and histories of anti-racist and anti-colonial social movements, in particular theorising boycott as decolonising work. She also works across multiple disciplines, spaces, collaborations: with artists, in community organising, refugee justice, media studies tutoring, and now with The Funambulist! She currently holds art history degrees from the University of Melbourne and the University of Oxford. With roots in Palestine and Detroit, Jenna Hamed is an art curator and writer based in New York City. Jenna’s work has been inspired by her career in fashion design and merchandising, and her current curatorial practice. Early on she became aware of the politics of art and fashion discourse, and has since dedicated to challenging and expanding the American canonical foci, de-centering the colonial logics to include the work of the historically rich contributions of the Arab and Muslim artist communities in the U.S. and beyond. Tomi Seyi Laja is a fourth year B. arch student at Iowa State University with a minor in French Language. She resides in the chicago-land area and was born in Nigeria. With interests in architecture and fashion, Tomi has been involved with student-run publications Datum: Journal of Architecture as well as Revival Magazine (assistant fashion direction in 2017 and styling in 2016), both out of Ames, Iowa. Moving forward, her goals are to use art and writing to promote afro- and eco-feminisms. Ella Martin-Gachot is a senior at Smith College in Northampton, MA. She studies Architecture and Environmental Science and Policy. After having spent her junior year at Ecole Nationale Supérieure d’Architecture Paris Val de Seine and Sciences Po Paris, she is co-directing a documentary about the intersections between space, gender, and sexuality, in particular how queer/LGBTQIA+ Parisians interact with the concept of home. She has worked at the Sustainable Food Center in Austin, Texas as a Community Health Intern and at Ateliers 2/3/4 in Paris as an Architectural Intern for the “Franchissement Pleyel” competition. Flora Hergon is a master’s student in sociology and gender studies at EHESS in Paris. She used to work for The Funambulist as an editorial assistant in 2017-2018 and is now conducting a research on the abuses of state of emergency in France, especially on the material, spatial and psychological effects of police home searches and house arrests in a context of state and gendered islamophobia. Noelle Geller received her B.A. in Literature, with a minor in History of Art & Visual Culture, at U.C. Santa Cruz. In 2016, she moved to Paris to pursue an MA in Arts & Cultural Management but disappointed by school, she learned more through the organizations, events and publications (cough:: The Funambulist:: cough) in the city. Interested in using story-telling to understand and fight oppression, whether through visual arts, journalism, or other forms, Noelle sees art and narrative as tools for stronger education, understanding and relationship-building.